Picture this. It is fairly late at night and you and your significant other are parked in front of the television, preparing to watch a blockbuster movie the two of you had rented earlier. Snacks are a priority at this point, so you start taking a mental inventory of your pantry and fridge. Popcorn sounds good, except for the empty calories, and the unhealthy chips, cookies and ice cream in the kitchen are just not what the doctor ordered. So what are your other options? Well, if you had a high quality food dehydrator, one that could make delicious beef jerky and a whole range of other dehydrated snacks—sliced apples, veggies and more—your snacking dilemma would be over. Instead of the sweet, salty and highly fattening snacks that most people turn to on movie night, you’d be able to nosh on some delicious and nutritious dehydrated snacks that provide you with all the vitamins, minerals and nutrients you need to lead a healthy lifestyle. Quick Answer: What are the best beef jerky dehydrators for the money right now? If a food dehydrator sounds like a good idea when you are in the mood for some tasty and healthy snacks, the following article may prove very useful to you. Here we will discuss the many benefits of owning one of these handy machines, and highlight the advantages and disadvantages of the two main types of food dehydrators currently on the market. We have also included a type of Food Dehydrator Buyer’s Guide, in which we will go over the various things you should look for when choosing one of these products—products that can simplify your life and provide you with some of the most nutritious and delicious beef jerky, as well as a variety of other dehydrated snacks. Is the Food Dehydrator Easy to Use? Owning a food dehydrator has many convenient benefits. In terms of snacking, a food dehydrator makes possible a whole new lineup of healthy snacks, the most popular of which is flavorful beef jerky, which can be made using a variety of delicious cuts of meat. 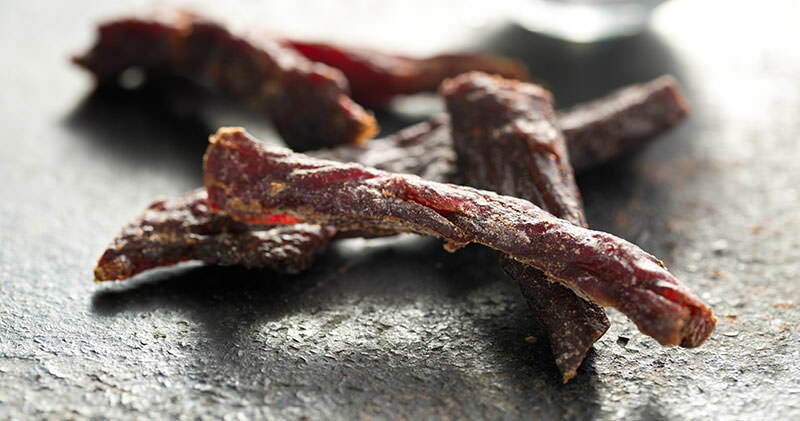 Beef jerky lovers will never again have to pay close to $10 for a package of store-bought jerky. Instead, they can make their own jerky, complete with all the spices and flavors that appeal to their individual palate. And beef jerky is not the only healthy snack that can be whipped up using a food dehydrator. Some of the other popular treats include apple chips, kale chips, banana chips and sun-dried tomatoes, all of which make for great on-the-go snacks that won’t expand your waistline. Given the many different manufacturers that now make food dehydrators (competition), buying one of these machines represents a very small investment with a huge payoff for you and your family over the life of the machine. Going camping? Before you do, spend a couple hours in the kitchen with your food dehydrator to make delicious beef jerky that tastes even better around the campfire. Need snacks for a road trip? Things like banana chips and apple chips will allow you to eat healthy on the road without worrying about putting on more pounds. Cost Saving. A food dehydrator can help save you a lot of money over the years—money you might have otherwise spent on store-bought snacks. Avoids Waste. No longer will you have to throw away day-old leftovers or produce from your garden or a previous grocery store outing. With a food dehydrator you can simply dehydrate these foods and store them safely away to be eaten at another time. Enjoy Out-of-Season Produce. Ever have a taste for a plum or a peach during the winter when these fruits are out of season? Now, with the help of your brand new food dehydrator, you can dehydrate in-season fruits and vegetables and enjoy them any time of the year. Dehydrated Foods Are Portable. If an emergency strikes and you have to evacuate, the food you dehydrated using your machine can easily be taken with you, and because it never has to be refrigerated once dehydrated, you won’t have to worry about electrical power when it comes to enjoying a snack on the go. Of course, no list of food dehydrator advantages would be complete without mentioning the amazing health benefits of this type of snacking. When most people want a quick snack, they unfortunately turn to fairly expensive store-bought snacks like chips, pretzels, cookies and other sugary and salty treats. Not only is this cost prohibitive, it is also very bad for your health. However, with a food dehydrator, making healthy snacks that also taste delicious has never been easier. These dehydrated foods provide loads of nutritional benefits, largely because most dried foods maintain all their nutrients, giving you the same benefits of all the vitamins and minerals that you would have got if you ate those food items fresh. Next we will take a closer look at the two most popular types of food dehydrators, and discuss the advantages and drawbacks associated with each type of machine. There are many different models of food dehydrators on the market today—models that come in various shapes, sizes and colors. However, most of these food dehydrators fall into one of two general categories: vertical flow food dehydrators and horizontal flow food dehydrators. The names given to each of these two general types of food dehydrators give you a hint to the primary difference between the two models. Each has a different orientation, meaning that one dehydrates with the food stacked vertically, while in the other type the food is lined up side by side. But the orientation associated with each of these machines is NOT the only way in which they differ, as the two types of food dehydrators work differently as well. Below we will take a closer look at each of these two types of food dehydrators while defining those dissimilarities. The less expensive of the two types, Vertical Flow Food Dehydrators have a heat source that is typically located either at the base of the unit or near the top of the food dehydrator. Also called “stackable unit food dehydrators,” they tend to be less pricey than horizontal flow food dehydrators, largely because the heat in the former does not circulate as evenly, making it harder to dehydrate certain kinds of food, and creating a longer process overall. To help with the poor heat circulation, most Vertical Flow Food Dehydrators include a fan to assist the unit in spreading the heat throughout the chamber, but because of its orientation this is not always enough. If your goal is to dry out fruits and vegetables, you will find that the Vertical Flow Food Dehydrator is fairly effective with most produce. However, when attempting to make tasty beef jerky you should not expect the same positive results unless you are willing to add a little manual effort to the process. In this case, that manual effort would entail switching the trays around during the dehydration process to ensure all the meat is being dried out evenly and at the proper heat. Affordable. Vertical Flow Food Dehydrators tend to be less pricey than their Horizontal Flow counterparts. Space-Saving. Most Vertical Flow Food Dehydrators are very small and compact. They will not take up much counter space, and they are easy to store once you have completed the dehydration process. Upgradable. With Vertical Flow Food Dehydrators, often times you can buy new shelves to expand the unit, allowing you to dehydrate more food in a single session without having to pay for a brand new larger dehydrator. Uneven Heat Distribution. The Vertical Flow Food Dehydrators do not usually heat as evenly as horizontal flow dehydrators. Difficult to Dehydrate Meat. The uneven heat flow makes it hard to evenly dry out meat, which typically must be done at a higher temperature than fruits and vegetables. Some Labor Involved. For best results, you will probably have to move the trays around on a vertical flow food dehydrator. Also known as “shelf tray food dehydrators,” Horizontal Flow Food Dehydrators operate a bit more like a conventional oven, as the heat source for these units is located at the back of the machine. Pricier than the vertical flow models, the horizontal flow food dehydrators tend to heat more evenly at a much better rate. This even and consistent heat makes them the dehydrators of choice for those who love to make beef jerky and other dried meats. In addition to being more effective and efficient than vertical flow dehydrators, horizontal flow food dehydrators are also easier to use than the former. Once you lay out the meat (or fruits, vegetables, etc.) and turn the machine on, you can simply let them go with no further work to be done until the dehydration process has been completed. Even Heating. The even and efficient heating of the horizontal flow food dehydrator enhances the “drying out” process and provides less of a headache for users. Versatile. The horizontal flow food dehydrator can be used to dehydrate almost anything you can think of, from beef and other cuts of meat like pork and even venison, to a wide array of fruits of veggies. Its even heating and no-fuss process will also allow you attempt more ambitious recipes. Easy to Use. Once you have lined up the meat, fruits or vegetables you intend to dehydrate, the horizontal flow food dehydrator will do the rest of the work for you. Costly. For obvious reasons, the horizontal flow food dehydrator tends to be more—and sometimes much more—expensive than its vertical flow counterpart. Larger. Horizontal flow food dehydrators are much larger in size than the vertical flow models. This is great for drying out large amounts of meat, but the unit does take up a lot more counter space and can be more difficult to store. A food dehydrator can be a positive addition to any kitchen. These machines come in various shapes, sizes and models, and no two food dehydrators are exactly alike. The exact type of food dehydrator you select will largely be a matter of preference, usually based on the various features these dehydrators offer, and how you intend to use the machine. That being said, food dehydrators come with a variety of convenient options—options you may or may not need in your particular situation. Regardless, it is imperative that you understand these options when shopping, as doing so will help you make the most educated and informed purchasing decision. To help you select the perfect food dehydrator for your particular needs, preferences and situation, below we have listed and defined some of the things you should look for in one of these machines, and some of the factors you should surely consider before making your final purchase. Dehydrating certain natural foods, from meats to fruits to vegetables, is not a very difficult process to comprehend. In practice, the process involves two factors: heat and time—one must keep the food in the food dehydrator at a high enough—and consistent enough—temperature for the proper amount of time—a time period long enough to dry out and extract the proper amount of moisture from the food, which will vary depending on the type of food being dehydrated. Being that some foods in the food dehydrator will be further away from the heat source, it’s important that you select a product with good airflow—airflow that will carry the heat throughout the unit, helping it to cook evenly despite a food item’s proximity to the heat source. On their websites, most food dehydrator manufacturers will usually speak to the subjects of heat distribution and airflow with each model they sell. If they don’t, make sure to ask your salesperson how a particular food dehydrator unit scores in the area of heating food evenly. This is important information to research. As we mentioned above, horizontal flow food dehydrators tend to heat more evenly than vertical flow models, thanks largely to their design. Many of the manufacturers of the vertical flow models have added fans to help improve the airflow, but this is not always enough, especially if your primary reason for purchasing and owning a dehydrator is to make beef jerky—which the vertical flow machines score low on. In dehydrating your desired snacks, the food dehydrator moves heated air very rapidly within a small space. The number of racks influences how much food you can dehydrate in a single session. Generally speaking, the more shelves a dehydrator has the more food it can dehydrate, assuming there is enough room for the food to be contained within the shelf. With horizontal flow food dehydrators, which heat very evenly, you should think about a machine with a higher number of racks, which will allow you to complete big batches of jerky in a single dehydrating process. With vertical flow food dehydrators, the more racks the unit has usually means more work for you, as you will probably have to move those racks around during the drying out process to ensure each has sufficient time near the heat source. Ease of use is an important consideration with any kitchen appliance. Chances are: the easier a machine is to use, the more often you will use it, thus enabling you to get the most from your purchase. Dehydrating food is a not a difficult process—usually. Once your meat, fruits or vegetables have been trimmed and cut to the desired lengths, then properly seasoned and refrigerated, the rest of the process is simple. With a horizontal flow food dehydrator, this is especially true. When working with these models, all you have to do is arrange the food upon the racks, set to the recommended heat and time settings, and forget about it. This is not always the case with vertical flow food dehydrators, as you may have to move the racks around to achieve proper dehydration. How easy a given food dehydrator is to clean is another consideration to look at. How many parts does the machine have? Are the parts dishwasher safe? Where is the fan located? These are all questions you should ask before deciding on the perfect food dehydrator for you. Any time you add a new appliance to the kitchen, it’s wise to first balance how much space the new machine will occupy against your current counter space. You should also consider the capacity of the machine—how much product can be dehydrated in a single batch. Vertical Flow food dehydrators, because of their design and orientation, will take up less space on your counter, as they are usually fairly small and compact. They are also, because of their small size, easier to store than larger food dehydrators. However, because of their compactness and the way in which they operate, the capacity of vertical flow food dehydrators is not very large, forcing you to do more batches to create the desired amount of dehydrated food. If you have a small kitchen, and you do not have the need for making very large quantities of dried food, this type of food dehydrator may be for you. Those who plan to make jerky, fruits and vegetables in large batches—such as drying out all the food from your garden before it goes bad—will want to look for a dehydrator with a larger capacity. Naturally, these also tend to be larger in size than the food dehydrators discussed above, thus taking up more counter space, but they will allow you to get the most out of your product. All food dehydrators are equipped with some type of fan, and you can reasonably expect some noise when making a batch of dried meats, fruits or vegetables. However, when it comes to noise, the decibel output tends to vary from one machine to the next. Naturally, you will want to look for a product that makes the least amount of noise when in use, but unfortunately, this is not a specification (spec) that is traditionally included with food dehydrators. To obtain this information, you will have to be a little creative. You can read reviews from customers who own a particular food dehydrator, go into forums dedicated to these products, or simply ask the salesperson if you can turn the unit on in the store just to check out the noise output on a given food dehydrator. Adjustable Thermostat. It goes without saying that different foods will dry out better and more completely under different heat settings. Therefore, the ability to adjust the temperature in your food dehydrator is a definite plus when trying to achieve the best results. If you plan to dry out more than one food type, a thermostat that can be adjusted is an absolute must. Timer. The ability to set your dehydrator to the desired time—the recommended time for a particular food item—will free you from having to watch the clock in order to check the progress of the dehydration process. Timers are a very convenient option and should definitely be included on the unit you decide to purchase. Auto-Shut-Off Function. Need to start the dehydration process and run off to work or bed? If so, the auto-shut off function is a must-have feature and a very convenient addition. Without getting into actual numbers, food dehydrators can vary widely in price. Horizontal flow food dehydrators are typically more expensive than vertical flow food dehydrators of the same size. Generally, the price of a food dehydrator will depend on a lot of independent factors, such as capacity, heat output, efficiency, and some of the convenient features that are included on these units. As you can see, there are many different types of food dehydrators on the market today, some of which work better with certain types of food. If beef jerky is your food of choice, we definitely recommend you choose a medium to large horizontal flow food dehydrator—one with enough capacity to make delicious beef jerky for you and everyone in the family in a single batch. Be sure to look for convenient features like a timer, adjustable thermostat and auto-shut off, and one that is dishwasher safe for your ultimate convenience.